Since playing grouped sports as a kid, I have been told that “There is no I in Team”. The notion was that each member had a role to play and the whole was bigger than an individual. This conjures up the image of the poster that says, “TEAM – Together Everyone Achieves More”. I still believe that to be true but I would like to promote a different spin. I believe that there is an I in Team and that “I” stands for Inspiration. This is particularly true for Team In Training. I am still proud and Inspired fifteen years later by how my father dealt with his diagnosis of CML and with the manner and grace he lived out his shortened final days. His inspiration is what eventually got me into the Team In Training program. I am just as inspired with how my mother, a cancer survivor herself, managed through losing her husband and carrying on alone these last fifteen years. We are greatly Inspired by our current honored heroes and each of the honored heroes from previous seasons. They have opened up their lives and struggles to us as they manage through what must be a very, very scary thing. Their courage is amazing. I find Inspiration in my fellow lane one swimmers. You will not find a group with more heart. By the way when my mother asked me how my swim training was going, I proudly told her that I was in lane one. She thought that was great. I chose not to correct her thought that the speedsters were in the other end of the pool. If you see my mother, let’s keep that our secret! Great Inspiration is found by all of our fellow teammates who initially had the courage to commit to raise money while preparing for an endurance sport and then the additional courage to recommit through the event. The dollar tally announced at the Inspiration Dinner that represents the aggregate of all of the hard work from their silent auctions, garage sales, bake sales, car washes, letter writing campaigns, et cetera being still provides goose bumps. Extra inspiration comes from those Alumni that do this season after season after season. We receive Inspiration by our TNT coaches, mentors and LLS staff, who give so much of themselves, well beyond what is asked but because they want to, so that we may be successful in our journey. Don’t forget the Inspiration by the efforts of the researchers that our raised dollars fund and the progress that is being made every day. We are inspired that some day cancer will be a disease of the past and that we will have a grand last event celebration where we will claim victory. John Dapper is currently training for The Nation's Triathlon 2010 team and has been involved with Team In Training in a number of roles including participant, mentor and now coach. John brings extensive experience from having participated with various chapters of Team In Training and has a strong passion for the cause. I've always heard the saying that a lot can happen in five years. So I started thinking, what all can happen in five years? Well, it takes nine months for a baby to be born. You can start and finish college; well at least that's the theory anyway. In my case, you can graduate from college, move to a new city, train for and complete two half-marathons and a marathon with Team In Training. Oh yeah and be in the middle of training for your second marathon. It seems like I've done a lot in those five years and to be honest, I'm not sure where the time has gone. However, in five years, I still have not learned how to come to grips with losing a friend to a blood cancer. You see, I recently celebrated my seventh year off chemo anniversary in April. While going through chemo, I met a lot of kids who were also fighting the terrible c-word. One of the people that I met who was also battling cancer, Todd, ended up becoming my best friend. I met Todd when I was fifteen and he was sixteen. He was diagnosed in May of 2000 and I was diagnosed in September of 2000. We both had ALL (acute lymphocytic leukemia). As Forest Gump would say, we went together like peas and carrots. We were completely opposite but yet, it worked. I was always really feisty (and still am); Todd was more laid back and would roll with the punches. I was an athlete and he was in the band. I was (and still am) an Ole Miss fan; he was an Auburn fan (which in the state of Alabama, things like that can make or break a friendship). The one main thing we had in common was that we each needed a friend, someone who knew what the other was going through and would take each other’s mind off of the reality of what was happening. You see, we didn't need sympathy, we needed normalcy and we provided that for each other. It took us each about three years to finish chemo. I completed my chemo regiment before graduating high school, but Todd had to enter his freshman year at Auburn still on treatments. I finished with relatively few setbacks. Todd had a harder time. I was lucky enough to have never relapsed. Todd relapsed and needed a bone marrow transplant. He traveled to Boston for his transplant and I remember being a freshman in college and spending my weekends talking to him over the computer so he could have some company, so-to-speak. I remember one Saturday in particular, we talked for twelve straight hours, with only a few breaks to go to the bathroom or get something to eat. Needless to say, he was my best friend and I loved him dearly. After he finished his transplant, he was allowed to come back to Alabama and start his sophomore year of college. He had decided to transfer to a school closer to his Alabama doctors, so he chose to enroll at Samford University in Birmingham. I was really excited about this, because I too was going to be a sophomore at Samford. That summer, I had to decide to stay at Samford or transfer to another school. I made the painful decision to transfer, but I knew that one day, the stars would finally align and we would find our way back to each other. Todd stayed right on track though and enrolled for the Fall 2004 semester. At least he was right on track until he hit another detour. A few months into the semester, he relapsed for the second time. This was not a good thing. The leukemia started showing up all over his body, not just his blood. I saw him a couple of times during this go-round and we would talk periodically. I just knew he was going to be OK. He would bounce back just like he did the previous two times. Unfortunately, five years ago today, July 19th, Todd passed away. To say that I was devastated was an understatement. How could this happen? We were Mal and Todd, The Dynamic Chemo Duo. We were supposed to grow old together and conquer the world, because if we could conquer cancer, then the only thing left was the world. But I guess it wasn't in the cards for us. I had to learn a hard lesson in life, that sometimes things don’t go the way you plan. Sometimes I catch myself wondering what could have been and how different the past five years would have been if he were still around. Last Wednesday, I really started thinking about how much I missed him. I called my mom and she told me the one thing I needed to hear. She told me that Todd would be mad at me for being sad and dwelling on it. And she's right. He would've wanted me to take that pain and sadness and turn it in to something good. I have finally started to realize that just because Todd's not here to conquer the world with me, I can still conquer it. People who find out that I run half-marathons and marathons ask me why I run. I usually tell them that I run because I can. What I should probably say is that I run because Todd can't, but more importantly, because I can and that's what he would want me to do. Mallory Chandler celebrated her seventh year anniversary as a survivor at the 2010 Country Music Marathon. 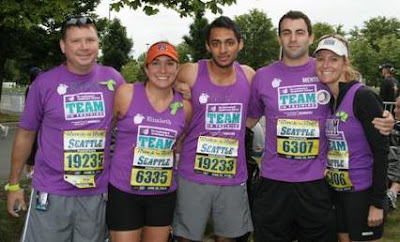 She is now set to do the 2010 Chicago Marathon with Team In Training. Mallory, thank you for continuing to inspire us all! You, Todd and so many others are why we do what we do. After only a few weeks of group runs and getting to know my new "team" I knew I had found friends for life as well as the courage to switch from my 1/2 marathon to a full marathon. The fundraising it turned out, was the easy part. When I had signed up to run, I didn't think I knew anyone that had battled a blood cancer-most of my family members who have been affected by cancer were usually fighting a different type. Throughout the several months of training I quickly realized how wrong I was and that I knew several people that were my new honored heroes that were battling, have battled, or lost their battle to a blood cancer. I was also really touched by another survivor, one of my new teammates, Ryan Watton. I knew that once I got to Seattle and began my 26.2 mile adventure that things would be emotional. Seeing the many other TNT'ers from across the country dressed in their purple and hearing "Go Team" cheers along the way really helped get me through my run. I also knew my knee and foot pain wasn't nearly as bad as a chemo treatment and thinking about my honored heroes and what they have been through, or what they are currently going through didn't compare. I knew that all of my training, hard work, and fundraising was for them. Crossing the finish line was an amazing experience that brought me to tears, but what really moved me came later that night. After the race our team went out to celebrate. We got into the conversation of honored heroes and why we do what we do. Throughout training (and my race) I was asked why I was running and who I was running for. I was doing this for a cause greater than me and didn't think much more about it. Ryan brought it all into perspective. I quickly came to realize that I am a hero too. Our heroes think we are heroes. They are so thankful that we would spend our time and be so dedicated to running for them and are inspired that we would do this in their honor. Throughout the whole experience I never really looked at it this way. I never thought what I did could compare to what they were going through. I was wrong. We both inspire each other, but in different ways. Team In Training has been a life changing experience that I will never forget. Not only did I make great friends, I learned a lot about myself, my capabilities, and the fight against cancer. I can't wait to do it all again. Big Sur anyone?? Elizabeth Kalifeh is a first time Team In Training participant and we are very proud of her accomplishment. Congratulations Elizabeth! Thank you for your commitment to Team In Training and sharing your story.